Sat., July 8, 3-4:30 p.m.
St. Anthony Village City Hall Council Chambers, 3301 Silver Lake Rd. Leslie Mackenzie, a writer-editor, serves as Community Organizer with Transition Twin Cities (https://transitiontwincities.org/tcgroups/). 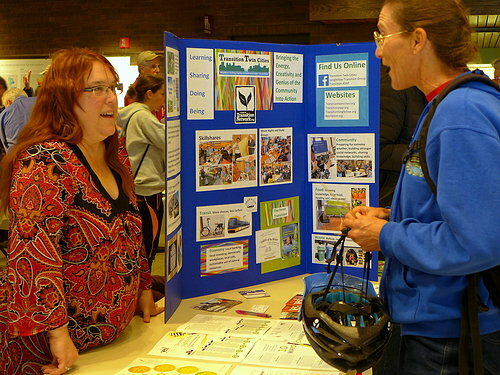 She is a active leader in Transition Longfellow, a community in south Minneapolis. She as also been active with the Tapestry Folkdance Center and FindLaw, a Thomson Reuters Business. Leslie leads transition workshops, and serves as the Twin Cities coordinator for the first Transition US National Gathering, which will be held at Macalester College in St. Paul, July 27-31. According to the article, “Partnerships in Sustainability” by Leslie Mackenzie and Marty Lewis, Transition Towns is a citizen-led movement that seeks to address individual and societal dependence on fossil fuels and the need to reduce greenhouse gas production in order to fight climate change. The foundation of Transition is permaculture, a design process based on whole-systems thinking informed by the patterns and relationships found in nature. Since its inception in 2005, the Transition movement has spread worldwide, as people in small groups and across large towns look for ways to take practical action to fight climate change: from home vegetable gardens to weatherization-work parties, from time banks and tool shares to renewable energy systems. Transition looks different in every location because it meets the needs and draws on the skills of the local community. This article looks at Transition in one community: The Twin Cities of Minneapolis and St. Paul, profiling several Transition Town groups. Note: Since last week’s issue was originally intended for this week, this issue is truncated, listing fewer articles, and with a minimal description of each. This might become the format, which is simpler to manage and easier to read or scan. Please let me know what you think. > Peak Prosperity: The Looming Energy Shock (Chris Martenson). There will be an extremely painful oil supply shortfall sometime between 2018 and 2020. It will be highly disruptive to our over-leveraged global financial system, given how saddled it is with record debts and unfunded IOUs. > Common Dreams: What Happened To America’s Wealth? The Rich Hid It. (Chuck Collins). There are actually trillions that could be used to fix our roads and schools. The wealthy just don’t want you to know where it is. > Yes! Magazine: Why Climate Change Belongs In The Health Care Debate (Stephen Miller). I know what global warming is doing to our ecosystems. Given the serious implications droughts, floods, and fires pose to our health, shouldn’t climate change be part of the health care discussions? > Peak Prosperity: Joseph Tainter: The Collapse Of Complex Societies (Interview: Adam Taggart, Chris Martenson). Tainter argues that the sustainability or collapse of a society follows from the success or failure of its problem-solving institutions, with societies collapsing when their investments in social complexity and their energy subsidies reach a point of diminishing marginal returns, which indicates we are likely already past the tipping point towards collapse. > Nature: Three Years To Safeguard Our Climate (Christiana Figueres, and five colleagues). “Should emissions continue to rise beyond 2020, or even remain level, the temperature goals set in Paris become almost unattainable,” they write. > The Guardian: Mayors Of 7,400 Cities Vow To Meet Obama’s Climate Commitments (Daniel Boffey). In opposition to Trump’s decision to withdraw from the Paris Accord, 7,456 cities, representing 680, 610, 749 people worldwide, and 9.40% of the total global population, have committed to the Global Covenant of Mayors for Climate and Energy. > Huffpost: Our Oceans Are A Human Casualty (Dana Ellis Hunnes) Our agricultural runoff, oilrigs, plastic, fish-glut, and noises are killing the ocean. > E & E News: EPA: Pruitt Will Launch Program To ‘Critique’ Climate Science (Emily Holden). U.S. EPA Administrator Scott Pruitt is leading a formal initiative to challenge mainstream climate science using a “back-and-forth critique” by government-recruited experts, according to a senior administration official. > Straits Times-Reuters: World Hunger On The Rise Again Due To Conflict And Climate: UN (Staff). A total of 19 countries are facing protracted crises, where conflict and violence are often combined with shocks such as drought or floods caused by global warming. > STIR Magazine: A Care Economy (Ed Mayo). Many of the most important and fulfilling parts of our lives—such as parenting, neighborliness, and favors—are about care, even if they’re not conventionally classed as economic activity. > MPR News: When It Comes To Recycling, You’re (Probably) Doing It Wrong (Tom Weber, Nancy Yang). Please stop tossing diapers, cellphones and plastic bags into your recycling bins, as well as batteries, garden hoses or electrical cords. > Resource Insights: Can We Live Without Progress? (Kurt Cobb). When speaking of progress, we tend to leave out the side effects—some of them very dangerous. Could we stand the thought that tomorrow and the day after that and the day after that might feel endlessly the same, our personal power neither increasing nor diminishing—or worse yet, possibly diminishing somewhat over time. > Environmental News Network: Are Your Fireworks Causing Pollution? (E.E. Smith). Our firework’s delightful explosions come with a hefty dose of pollution. It doesn’t have to be that way, though—in fact, many municipalities are seeking out alternatives that allow residents to enjoy the fun, minus the environmental impact.